Submitted by webmaster on Wed, 21/10/2009 - 22:15. Irish cement multinational company, CRH owns 25% share in Israel’s largest cement company, Nesher Cement. Israel’s Annexation/Segregation/Apartheid Wall (all labels are correct) snakes through the West Bank cutting off people from each other, from their farmland and from 65% of their water wells and springs. Nearly 100,000 Palestinians are trapped between the wall and the 1967 green line, thereby placing them in no-mans land. The goal is clear: Israel wants those people to clear out of the area, thereby de-Palestinianising a further 10% of the West Bank. Palestinians frequently organize peaceful protests against the building of the Wall, which is in its 8th year of construction and nearly complete. Usually they are met with tear gas and arbitrary arrests. Sometimes much worse happens as in the case of 16-year old Mohammad Qadus who was shot on 20 March, 2010 as he was carrying to safety his critically injured friend, Asaud Qadus, who himself had just been shot in the head. According to Stopthewall.org, of the 16 people murdered by the Israeli military in connection with anti-Wall protests since 2002, half were under the age of 18. Despite calls from civil society to divest, CRH continues to unashamedly profit from the building of this apartheid structure as well as from the building of illegal settlements on occupied Palestinian land. This year the CRH Annual General Meeting starts at 11am Wednesday May 5th, in the Royal Marine Hotel, Marine Road in Dun Laoghaire. 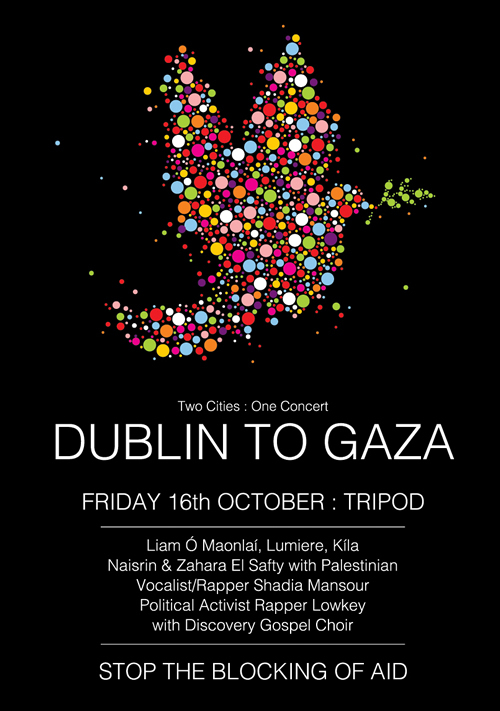 The Ireland Palestine Solidarity Campaign (IPSC) is organising a protest outside. Protestors will be assembling at 10.15am at the Catholic Church plaza. Submitted by MichaelY on Thu, 15/10/2009 - 11:23. Submitted by IPSC on Wed, 14/10/2009 - 17:02. 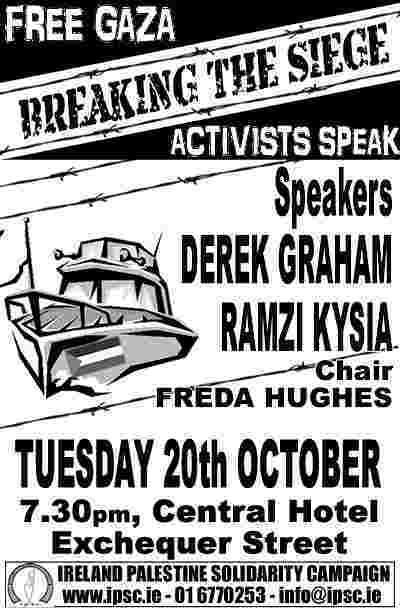 On Tuesday 23th October, the IPSC Dublin branch are proud to present activists from the Free Gaza Movement, Caoimhe Butterly, Derek Graham and Ramzi Kysia. Submitted by IPSC on Thu, 08/10/2009 - 18:48. Submitted by IPSC on Wed, 07/10/2009 - 19:14. On Tuesday 23th October, the IPSC Society in NUIM are proud to present activists from the Free Gaza Movement Caoimhe Butterly, Derek Graham and Ramzi Kysia. 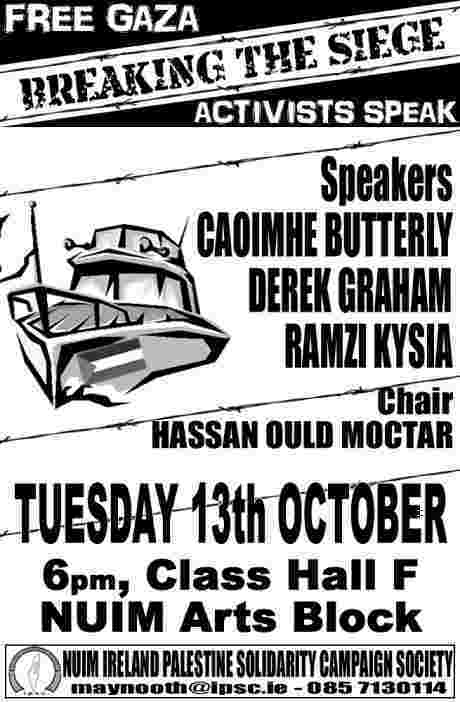 They will speak in NUI Maynooth, building support for the Irish boat set for Gaza at the end of October. Submitted by kieran.osullivan on Thu, 17/09/2009 - 16:58.